This is "Bug report" page in EurekaLog project's options. Bug report page contains local exception logging options. You can enable/disable saving bug reports to file here. See this article for more information about bug reports. 1. "Save bug report to file" (.SaveLogFile) option enables saving full exception information report into a file. This file is plain-text report file, which can be viewed in any text editor or special viewer application: EurekaLog Viewer. Bug report contains information specified on Bug report content page. Single file can contains multiple problem reports. 2. "Bug report's location" (.OutputPath) option specifies path on file system, where you want to save bug report. 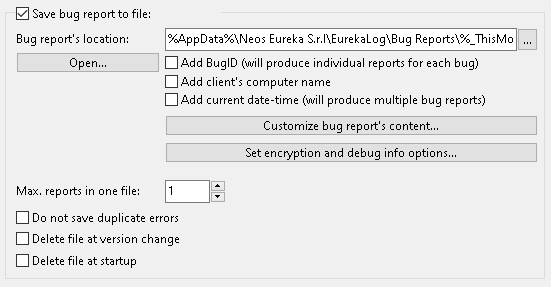 Default is a project's subfolder in "%APPDATA%\Neos Eureka S.r.l\Bug reports\" (see also). Empty string means default path (i.e. the same folder - "%APPDATA%\Neos Eureka S.r.l\Bug reports\"). You can use environment variables to specify dynamic-changed paths. This option can specify folder only (ends with path separator - '/'). In this case: default file name ("your-project.el" - for example: "Project1.el") will be used. Alternatively, you can specify both path + file name. In this case: specified custom file name will be used. Note that you also can alter file name by using the following 3 options (see below). If you want to save bug report to the same folder as executable module - use ".\" folder. You can also use any other relative path, like this for example: ".\Reports". Do not save bug report to .exe's folder, if you install your application to Program Files. Use exe's folder only for mobile applications (for example: runnable from flash sticks). 3. If you want to specify a file name - you have to add the file extension (like ".el"), otherwise file name will be treated as folder. Important Note: %APPDATA% folder is specific to user account. Each user account has its own %APPDATA% folder. EurekaLog will use %APPDATA% folder of user running your executable. For example, if you are writing a Win32 Service application - such application is run by "Local System" account by default. "Local System" account has its own %APPDATA% folder, for example: "C:\WINDOWS\system32\config\systemprofile\AppData" or "C:\WINDOWS\SysWOW64\config\systemprofile\AppData" (depending on bitness of your application and operating system). 3. "Add BugID" (.loAddBugIDInLogFileName) option alters default file name by appending a Bug ID value to it. Bug ID is a hash value of type and location of the problem. Exceptions with the same Bug ID is considered to be the same. Warning: checking this option will result in multiple log files for your project (one file for each exception kind). It's recommended to keep this option checked off (unchecked). Note: there is a similar option which is applied to name of send bug report only. You may consider using it instead of this option. 4. "Add client's computer name" (.loAddComputernameInLogFileName) option alters default file name by appending a name of client's machine value to it. All non-allowed file name characters will be replaced with safe replace character ('_'). 5. "Add current date-time" (.loAddDateInLogFileName) option alters default file name by appending a current date-time value to it ('yyyymmddhhnnss'). Warning: checking this option will result in multiple bug report files for your project (one file for each exception occurrence). It's recommended to keep this option checked off (unchecked). 6. "Max. reports in one file" (.ErrorsNumberToSave) option allows you to limit capacity of a single file. It specifies how many bug reports can be hold in 1 file. Once limit is exceeded, oldest report in file will be deleted and new report will be saved as last report. Value of 0 means unlimited bug report file. Typical values can be 0, 1, 32, 256, 9999, etc. Setting this option to 1 is almost equivalent of (non-existed) "delete log file before exception" option. 7. If you enable the "Do not save duplicate errors" (.loNoDuplicateErrors) option - then file will contain only unique bug reports, count field (2.8) will contain number of occurrences for each exception (if fields is present, otherwise duplicate count information is omitted and lost). When this option is unchecked - all reports will be saved, count field (2.8) will always be 1 for all reports. • Report uniqueness is established via Bug ID property. Bug ID is a hash value of type and location of the problem. Exceptions with the same Bug ID is considered to be the same. • Usually you should set a limit for maximum reports in one file greater than 1 to get useful results from this option. If you set limit to 1 - this option will have almost zero effect. • This option doesn't require count field (2.8) to be included into bug report. However, usually you use these two options at the same time. • This option affects only local bug report file. It does not affect sending. 8. "Delete file at version change" (.loDeleteLogAtVersionChange) option deletes bug report file, when application's version change. This is useful when you store multiple reports in a single file and don't want a "noise" from old version of your application. • you limited capacity of bug report's file to 1 report. • you doesn't specify version information for your project. • you doesn't include application version into bug report (field 1.3).